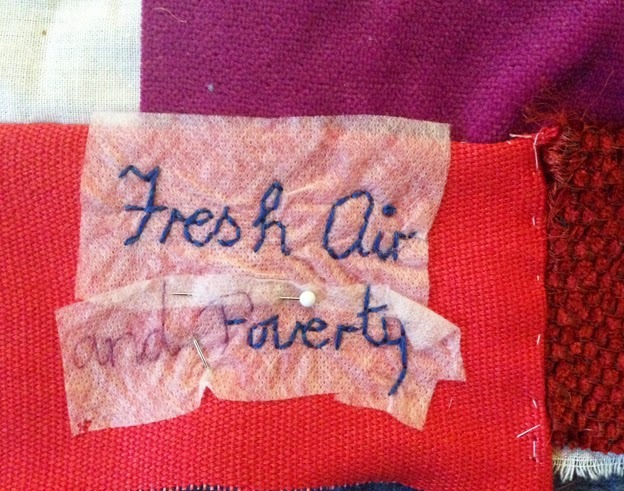 'Stitching the Wars' workshops re-started today at the Age UK day centre in Hope, Derbyshire We made a start at the second quilt- working title 'Fresh Air and Poverty'. The theme for this- 'Poverty and Strife' associated with the 1st and 2nd World Wars and their aftermath. 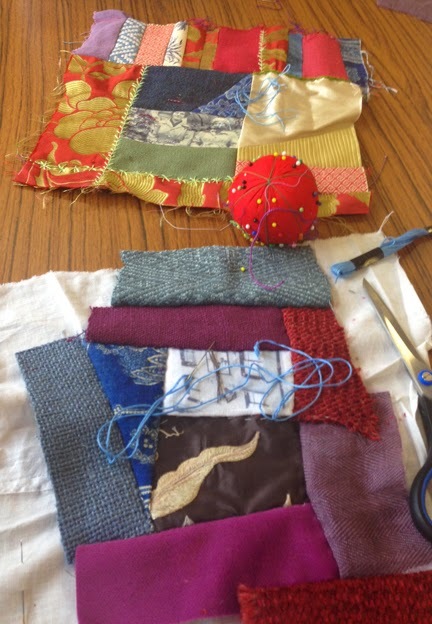 As with the previous quilt, we will be capturing snippets of reminiscence in stitch, this time using 'Crazy Patchwork' technique. 'I went to Great Longstone School, Percy Buggins was the Head Master. We had no school dinners, would walk home for lunch. My aunty had 8 children, they used to come for lunch too. Also I had 1 brother and 2 sisters. About half a mile walk home, halfway back there used to be a fella that would expose himself! we used to say 'will Billy Ball be here today?'. 'I started work at 14 making steel razor blades, it made me hands course, I cut me big toe, it were awful, lots of people got hurt. I chopped my finger off- it wasn't my fault, it was my boss giving me the wrong instructions. After a stay in hospital, then back home quite a long time, I went back to the razor packing machines. He got me £10 compensation, my wages at the time about 8 pence a day. Terrible weren't it. 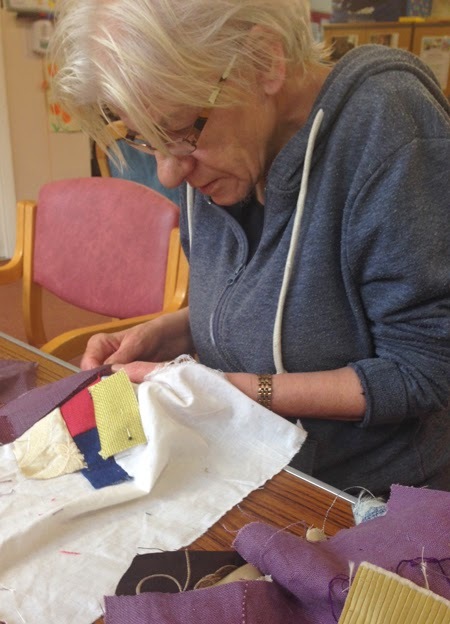 Janet stitching her crazy patchwork.